A rare chance to enjoy two of Mrs Gaskell’s pastimes: a picnic and a visit to one of Knutsford’s grandest houses! Elizabeth Gaskell’s love of picnics is well-documented, and many picnics and garden parties feature in her books. To celebrate the time that Mrs Gaskell, best known for ‘Cranford’ and ‘North and South’, came to Tabley and enjoyed a picnic on the estate when visiting the Old Hall, Mrs Gaskell’s Picnic will take place at Tabley House, on the grounds of the former Old Hall. Hosted by The Tabley Tea Room, special picnic lunches inspired by Mrs Gaskell herself will be available to purchase to be eaten inside or outside of the tea room, or visitors are welcome to bring their own picnic. 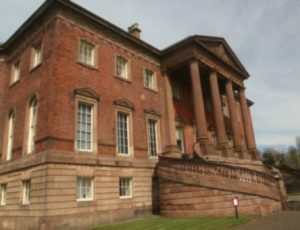 Entry to Tabley House, home to the magnificent Tabley House Collection, is free of charge. Visitors are welcome to arrive in period costume in honour of Mrs Gaskell! The house is accessible for those with mobility problems or wheelchair users. Please phone 01565 750151 before visiting if this facility is needed, as a separate entrance is used. For those using the usual entrance, please note there are some uneven surfaces and steps. The Tabley House Collection is housed in the finest Grade I Palladian mansion in Cheshire. The estate was home to the Leicester family for 700 years, until the mid-1970s. Their legacy includes some of the finest art, furniture and books that money could buy. St Peter’s Chapel originally built on an island in the Mere in 1678, was moved in 1927 and re-erected on its present site adjacent to the house. The Chapel, has impressive stained glass, with one window designed by Burne-Jones. It was recently used as a location for the hit TV series ‘Peaky Blinders’.